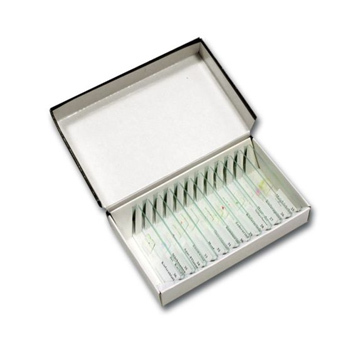 This slide set contains 12 prepared microscope slides of various plants. Bug out with these sets of 4 real, 3D insect specimens perfectly preserved in resin. These specimens are ideal for observing and imaging with any Stereo microscope. Crystal clear resin lets you observe the insects from all angles. Use them for school projects, research, and more. 3D insect specimens perfectly preserved in resin. These specimens are ideal for observing and imaging with any Stereo microscope. Immersion Oil 15ml - for use with x100 objectives. Methylene blue - A good general purpose stain that colours most structures varying shades of blue. Recommended as an introduction. Slide box for 25 slides - A quality plastic slide box. Index sheet and 25 slots for standard microscope slides. Slide box for 50 slides - A quality plastic slide box. Index sheet and 50 slots for standard microscope slides. Petrie Dish - Plastic petri dish and cover.